I gotta say….I loved, loved, LOVED working with Lisa Marie and creating this custom web design for her salon. Not only was the site and brand visually really fun to create but Lisa Marie was a dream to work with. And, if I ever need any cosmetic or medical tattooing, I’ll be hitting the road for the nine hour drive from my house to her salon in the California Bay Area. Though she’s had her salon for years, Lisa Marie had never had a website before, so this was a new adventure for her. At her salon, she does cosmetic and medical tattooing as well as microneedling, lash and brow enhancement, and tattoo removal. She also provides training for aspiring cosmetologists who want to add the services she provides to their repertoire. Lisa Marie wanted her site to highlight all of her services as well as allow for clients to schedule appointments or register for her workshops. She also had some ideas on color and feel for her brand, but she was totally open to ideas and all in on closely collaborating with me to create her site. We began by focusing on her goals and streamlining the pages that would appear on her site. There was quite a bit of information to include and giving each service it’s own page would make the site more difficult to navigate, so we broke her offerings down into categories and focused on organizing her services that way. 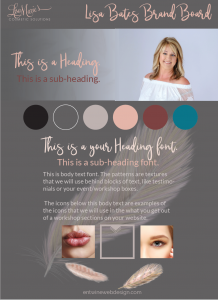 Once we had the site organized, Lisa Marie was off to write her copy, fill out her website and branding questionnaires, and create her Pinterest board to get the branding inspiration going. We started the project by creating her website logo and brand board. She wanted her site to be soft and feminine, but during our initial discussions, I realized that she’d like a site with a darker background which was a fun challenge. And, I love what we came up with using the charcoal grays, soft rose pinks, and feathers. After we drilled down her logo, I developed three different potential brand boards for her based on the Pinterest board she’d created as part of her homework. She loves rose gold and gray, and she also had quite a few feathers on her Pinterest board. These colors worked beautifully with all of the photos on her site that demonstrate her work: cosmetic and medical tattooing. Next we dove into the site design and development. 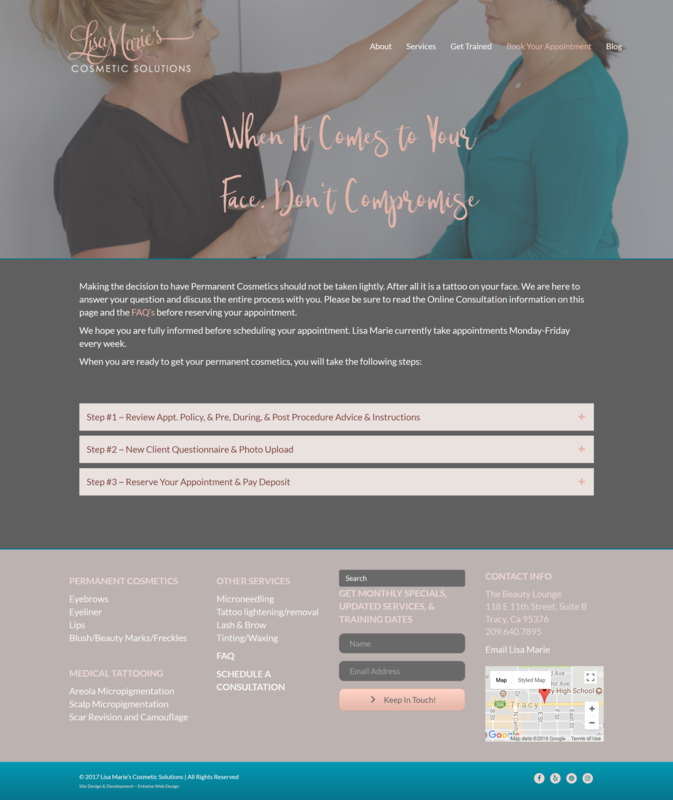 This is a big website that serves two different client groups: those wanting cosmetic and medical tattooing services and those wanting to learn how to provide those services. So, we created pages dedicated to explaining each of her services and booking appointments. We also created a page dedicated to the courses she offers. All of these pages offered the ability for clients to book appointments or register for courses. On her homepage we highlighted Lisa Marie with a beautiful photo and a clear statement of what she does. We also chose to highlight the major categories of her services on her homepage rather than every single service because she has quite a few offerings. We also didn’t want to have huge numbers of drop down menus below the services link in her main menu, so we put them on the homepage. All of the links on her homepage lead to more information about each of the services. On the bottom of the homepage we put an Instagram feed which she updates quite frequently. We decided to use her Instagram feed rather than a dedicated Portfolio page because Lisa Marie is already active on Instagram and updating her “portfolio” of work on that platform, so there was no reason to add a whole Portfolio page that would also need to be updated. We also were able to include all of her intake forms and pre-and post procedure as well as appointment scheduling on a page dedicated to booking appointments. To fit all of this information, we used accordion boxes that open on click. We fit a TON of really crucial information on this page using that strategy. Finally, Lisa’s gorgeous new site is fully responsive and looks great on phones and tablets. I am delighted with how Lisa Marie’s site turned out. If you’d like to see it “live” and in action, you can check it out here: Lisa Marie’s Cosmetic Solutions. I’d love to hear your thoughts! What do you think of Lisa Marie’s new brand and website?